It's the last official weekend of summer. Of course, here in Los Angeles, summer weather will probably continue until mid-October. We wear white shoes and Hawaiian shirts all year long. We can also partake of summer sports for almost 12 months. due to our perfect Southern California weather. 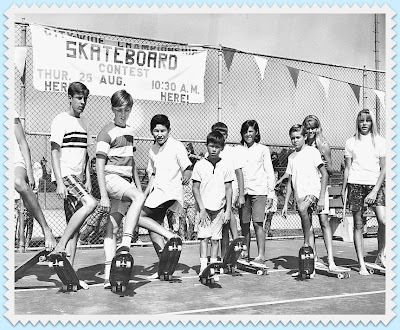 Skateboarding has become an international sport, originating right here in SoCal in the late 1950's. 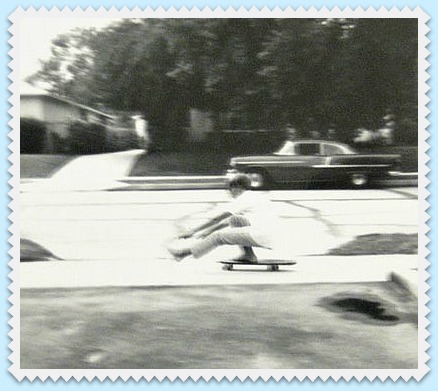 In the early days, kids just attached their roller skate wheels to a board and started sidewalk surfing. 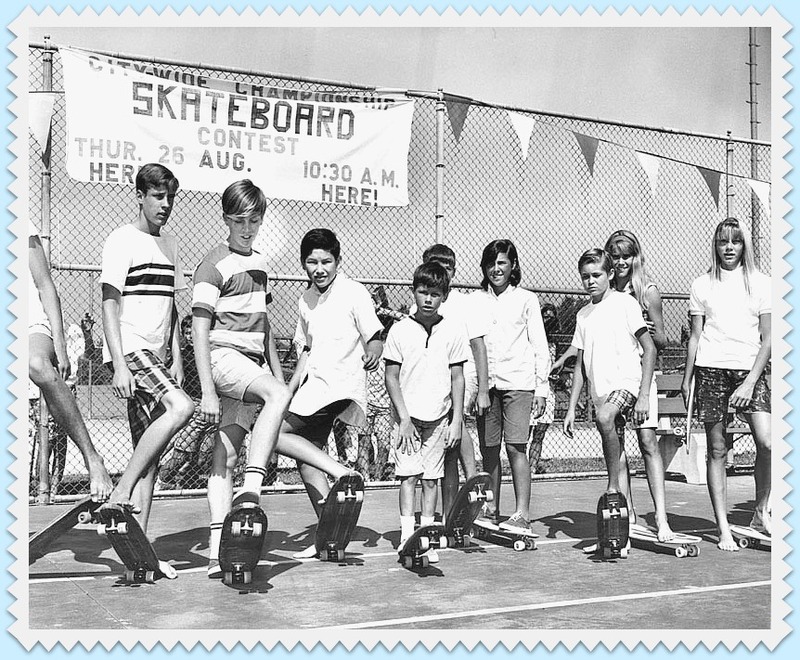 Later, mechanical innovations improved the wheels and shape of the boards. Last night Larry invited me to a one-night-only art show and film premiere at Blum & Poe Gallery. His customer, Gregg Gibbs (painter and film maker) invited us to see his documentary, "I, Gauguin." It turns out the the subject of the film, Lee Don Taicher is also a customer of Larry's. He photographs their artwork for reproduction. An explanation of the process here. Taicher is a successful business man turned artist and film maker. Before the screening, we viewed much of Taicher's artwork, including Gaugin-like paintings of Island scenes which were quite lovely AND Taicher's gestural abstract canvases. There were hors d'oeuvres and drinks provided by Animal Restaurant. The event was well attended by L.A. art luminaries, including the Godfather of low-brow art Robert Williams, Bergamot Station gallery owner Greg Esclalante and more. 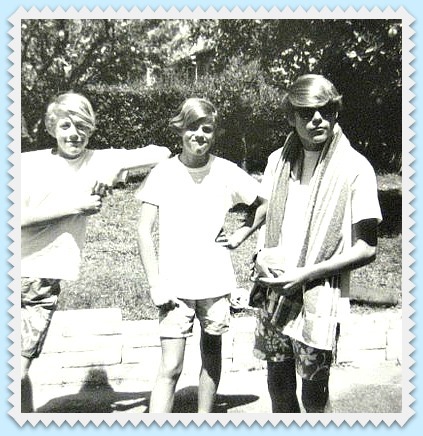 Gregg's film is about Taicher's journey to make a movie about the last days of artist, Paul Gauguin, called "Finding Gauguin.". Taicher's resemblance to Gauguin is startling. Of course, he portrayed the great artist in his film. After hearing about Larry's experiences with Taicher druing the photographing of Taicher's artwork, I was not surprised by the direction that Gibb's documentary took. It showed Taicher's attempt to control every situation during his movie shoot with drastic results. Many of the cast and crew members were present....laughing along with the rest of us. I do not know for sure, but from my vantage point, it looked like Taicher wasn't particularly pleased with his portrayal in this documentary. This was my first time at the beautiful Blum & Poe Gallery on South La Cienega. It's a fabulous, museum-like space with a desirable parking lot! It was a fun evening in spite of the fact that I secretly wanted to slap Lee Don Taicher in the face many times over during the screening! On Saturday, my yarny friend, Leo gifted me with a belated b-day gift. 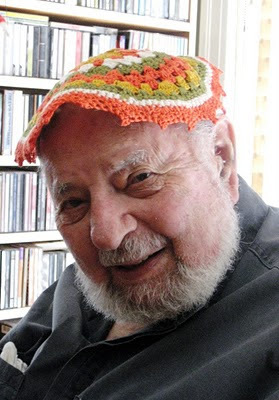 I'd seen this hat on Leo at an El Segundo Knitters Guild meeting awhile back and admired it. So, Leo crocheted one for me. I do like that this hat looks like a fez, reminiscent of exotic, mysterious men of the east or Shriners! 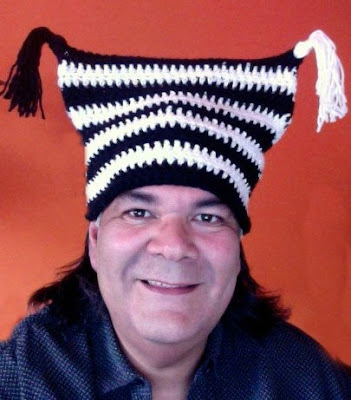 In fact, I've even crocheted a baby fez myself! Leo asked for my head measurements. I gave them to him. For some reason, his gauge must have been off a bit. 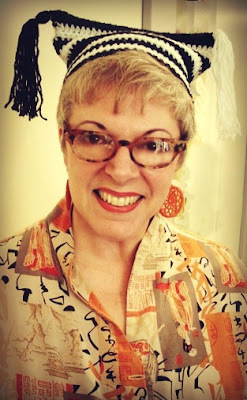 My fez turned out kinda' small, more like a fascinator than a traditional hat! A fascinator is a tiny hat that perches on the edge of your head, with a jaunty slant. I do like my jaunty fez...I think it's cute.....and rather fascinating! Last night Larry and I decided to give the newish restaurant, Sunny Spot a try. Chef Roy Choi, along with his talented team, created this Caribbean style restaurant in the former Beachwood Restaurant location, formerly Hank Vendetti's Pizza place on Washington Boulevard, surrounding Marina del Rey. The interior is cool, hip thrift shop--late '60's, early '70's...very bright and colorful. The patio is large. The service is good and the food is totally entertaining. 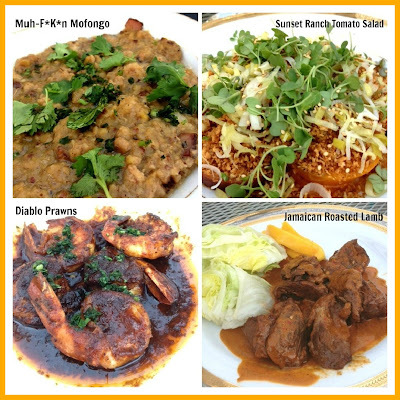 The combination of spices and sauces used with the freshest of ingredients is enchanting! There is also an extensive cocktail menu! We started out with the Sunset Ranch Tomato Salad with compressed melon, shiso, breadcrumbs and spicy vinaigrette. Next dish that came highly recommended was the Muh-F*K*n Mofongo which is mashed plantains, bacon pieces, garlic and black pepper. It really looks like mush, but tastes divine! For our main courses, Larry ordered the Prawns Diablo and I ordered the Jamaican Roasted Lamb. The Prawns had a rum glaze, garlic butter and were dusted with spicy herbs, with a mole' flavor. The Lamb was served in a yummy red sauce with a hint of coconut, alongside a wedge of lettuce and pickled mango. This was an excellent dining experience. We will definitely return to Sunny Spot. Larry and I stopped at the Autry Museum yesterday to see "California's Designing Women, 1896-1986." It was a good exhibit, curated by our friend, Bill Stern. I was expecting a larger selection of objects, but space is limited here at the Autry. There was pottery, furniture, fashion, jewelry, tapestries, lamps, decorative objects from the Arts and Crafts Movement and more. 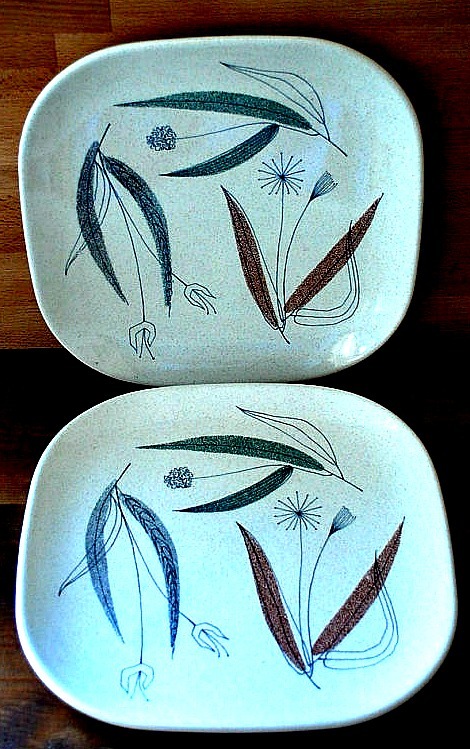 I was most interested to see the Franciscan plates designed by my former ceramics teacher, Esta James. 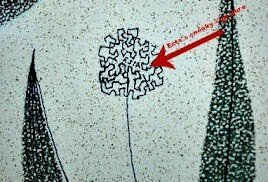 Even though Esta was designing for the mass-manufacturer who did not want individual artists' work recognized in their dishes, Esta managed to hide her name inside the flower design. 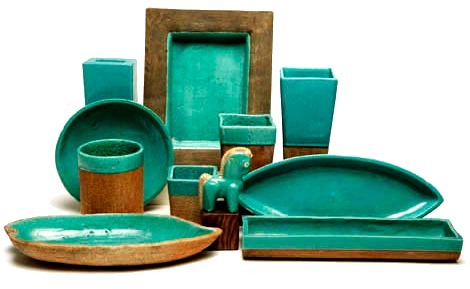 She was a wonderful ceramics teacher. 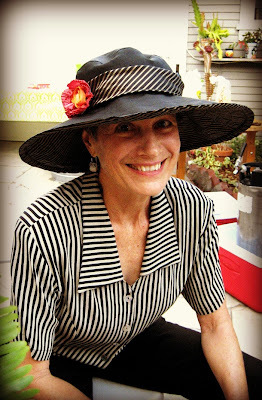 I attended classes with Esta at Idyllwild School of Music and the Arts when I was a teenager. We also viewed some of the pop-culture western art in the Autry's permanent collection. Who doesn't like seeing Hopalong Cassidy lunchboxes, Annie Oakley posters and Roy Rogers' decorative cowboy boots? Map to illustrate the Ponderosa in Nevada, 1959. Gene Autry and his horse, Champion. Vintage Photo Friday - Happy B-Day Uncle Mort! 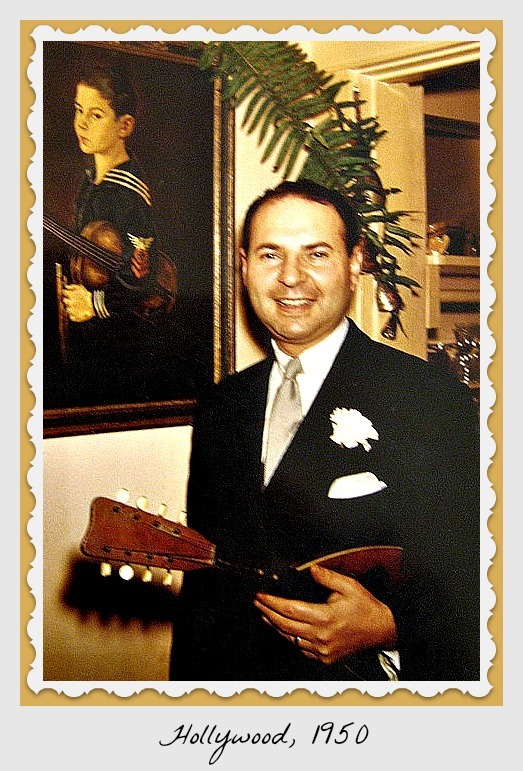 Yesterday was my Uncle Mort's 95th birthday! Wow! A few friends and family gathered at Mort's house in Playa del Rey for a b-day barbecue and birthday cake. It was a grand celebration with lots of laughter and great stories. 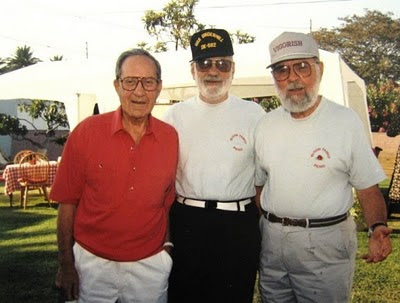 Mort is the oldest of three brothers, my Dad, George was the middle brother and Uncle Hi was the baby. Both George and Hi are gone now, so Uncle Mort holds the key to all Bloom-related stories. Luckily, all brothers have passed down much family lore to their children. I rely on my cousins and brother to fill me in on various aspects of the Bloom family history that I may have missed along the way. 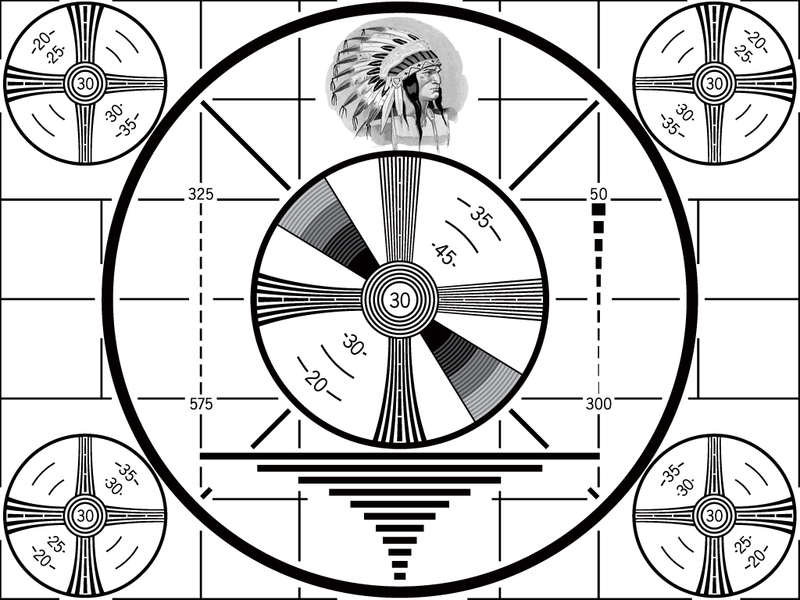 Together, we are a font of hysterical and historical knowledge. 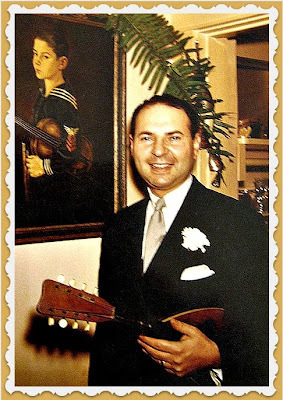 Thanks for the ongoing stories and memories, Uncle Mort! Happy Birthday! More results of my latest hobby....snapping vanity license plates while sitting in traffic or hanging around knitters! I spent my lunch hour on Tuesday with some Westside knitters at Clover Park in Santa Monica. It's lovely to sit in the shade, knit and chat with friends. I spotted a few excellent license plates in the parking lot. I suspect that this is fellow-knitter, Tiaré's car. She had just come from her French language lesson at Le Lycée Français de Los Angeles. "Poivre" means spicy!! Above, possibly a fashion expert who owns a small boutique in Los Angeles? This plate belongs to a huge SUV, big enough for the WHOLE FAMILY! Happy driving! Have you spotted any fun license plates lately? Yes, I know. I have a few other projects started, lingering in their tote bags. Being exposed to so many talented knitters and crocheters, I'm constantly bombarded with interesting ideas, new projects and beautiful yarn. Whenever I see something new, I want to start that project too! I've had this lovely washable Newton's wool in my stash since last September...almost a year. I bought it at Vogue Knitting Live when the conference was in nearby Century City. Newton's has great yarn at amazing prices. 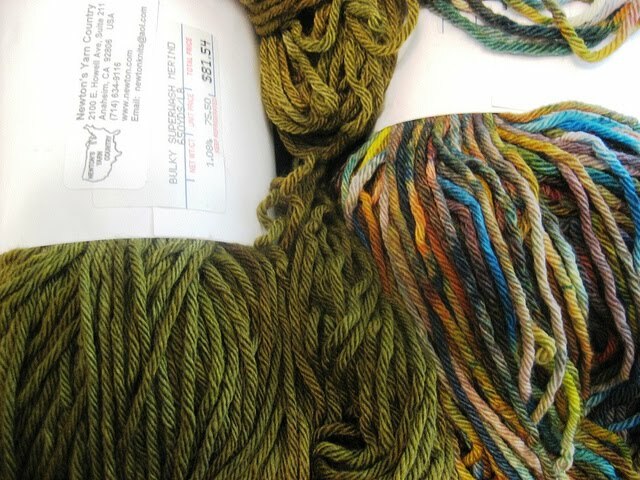 I thought that these two yarns would look harmonious together in a cardigan or a shawl. I put other projects on the back-burner and started a basic top-down cardigan, using the formula from Wendy Bernard's "Custom Knits" book. Since I have more of the solid green and less of the multi-color yarn, I decided to stripe the yoke portion of the sweater in plain stockinette stitch. The bottom is solid green in the Gull Lace Pattern. I will knit the sleeves in the gull lace pattern too in solid green and then use the rest of the multi-color yarn for the collar, cuffs and button band. I suppose you could call this a modified February Ladiy Sweater. I hope the cardigan is not too busy. I do love these colors for fall. A few weeks ago I got out my Kindle to read a few chapters of "A Natural Woman" by Carole King. I'd just charged the Kindle because I hadn't used it in a few days. The screensaver was frozen and fractured. I pressed a few buttons, turned up the volume and found that my Kindelah still talked to me, but wouldn't let me see the pages of my book. She's only 1-1/2 years old! I never dropped her. I never left her in my hot car to melt. I've been a good step-mom to my sweet Kindelah! I contacted Amazon.com's Kindle Support. After much back-and-forth, Support suggested that I replace my Beloved with a newer version. O.K. this set me back another $65. Oh well, I'm addicted. Since I've owned a Kindle, I've been reading MUCH more. The convenience of having this small device with me at all times has brought me into the digital age. I'm now the proud owner of a sleek, smaller Kindle that goes with me everywhere! What are you reading now? Yesterday we were in Pasadena for a memorial. The tribute didn't start until 2-ish, so we thought this would be a good opportunity to have a quick lunch at the Pie 'n Burger, a Pasadena institution. We arrived at 12:45...the tiny restaurant was packed. In spite of the intense heat in the Pasadena area, people were out and about. 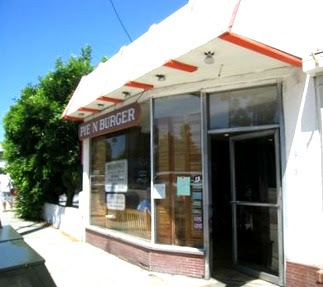 The Pie 'n Burger has been here since 1963 and it is air-conditioned. We only had to wait about 15 minutes for a seat at the counter. Naturally, we both ordered cheeseburgers. It was too hot to have fries and pie. Come to think of it, the burger here always fills me up so much that I've never ordered a piece of pie. Everyone raves about the pie. The interior could use a bit of TLC. Many of the counter chairs are broken, a fresh coat of paint wouldn't hurt the ceiling, the late '60's plaid wallpaper looks pretty good and adds to the ambiance of this country-kitchen-style coffee shop where they serve simple, yummy food with a smile. 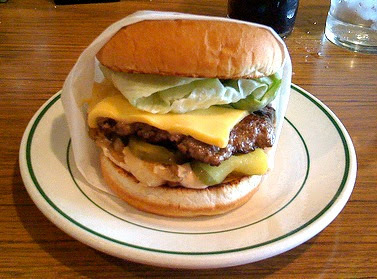 To me, the burger is just right....not too thick, cooked perfectly, accompanied by a big hunk of iceberg lettuce, tomato, pickles and Thousand Island dressing. I added grilled onions and American cheese on my burger. I would compare the taste of the burger to In 'n Out, but a bit less greasy. It's not extraordinary, but if you're in the area, this is a perfect place to stop for a quick lunch or dinner. 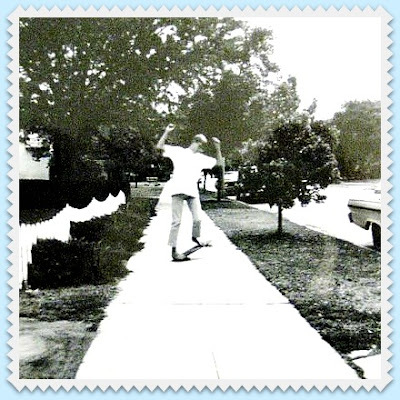 Read about the origins of this vintage image here. 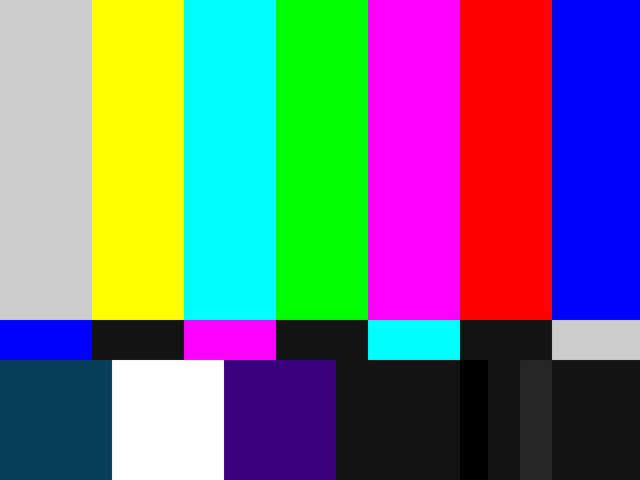 Personally, I'm partial to the color t.v. 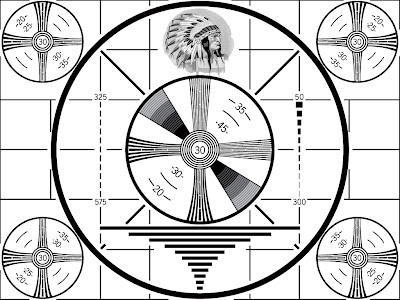 test pattern from a later era! Read about it here. This would make an excellent afghan design. Have a wonderful weekend! Here's another installment in my never-ending quest for entertaining vanity license plates in Los Angeles! Feel free to make your own observations! 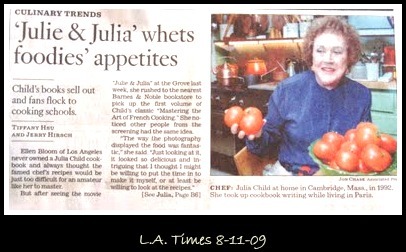 Today would have been Julia Child's 100th birthday. 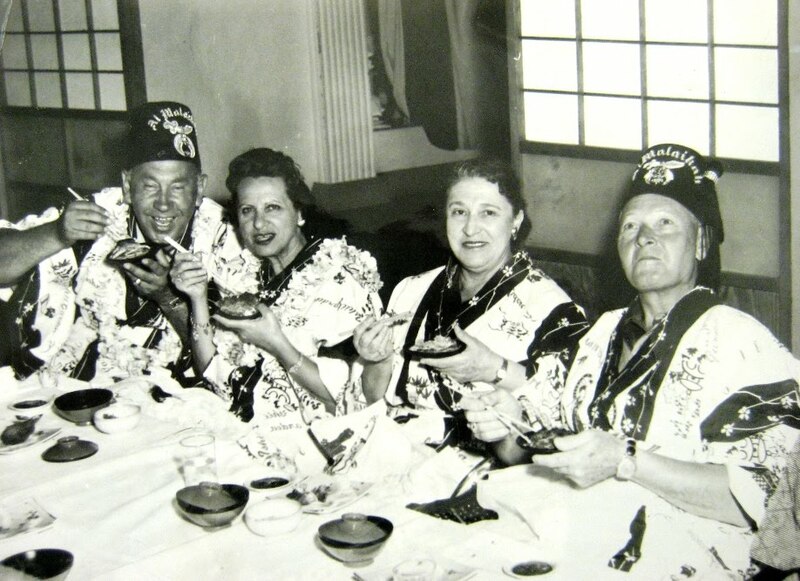 She influenced generations of women to experiment with fresh ingredients and new recipes. Her television show on PBS, her cookbooks and public appearances helped bring sophistication to the American palate. In 2009, the movie "Julie and Julia" was released. I loved the movie and immediately went out and bought the cookbook, above. 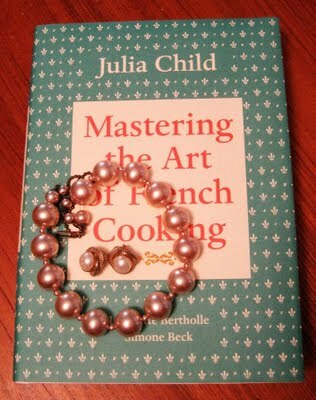 In celebration of Julia Child's 100th birthday, today's blog post is HERE, a repeat of my 2009 post. I like to participate in yarny swaps involving small items. 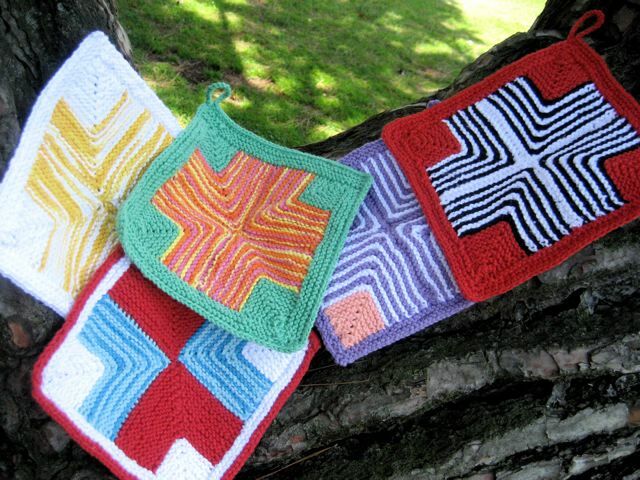 Two of my favorite swaps on Ravelry (excellent online community for yarny folks) are the Potholder Swap and the Dishcloth Swap. It's fun planning your designs, discussing them on Ravelry with other members and then actually making the designs and sending them off to your swap-partners. I just love seeing what everyone creates! 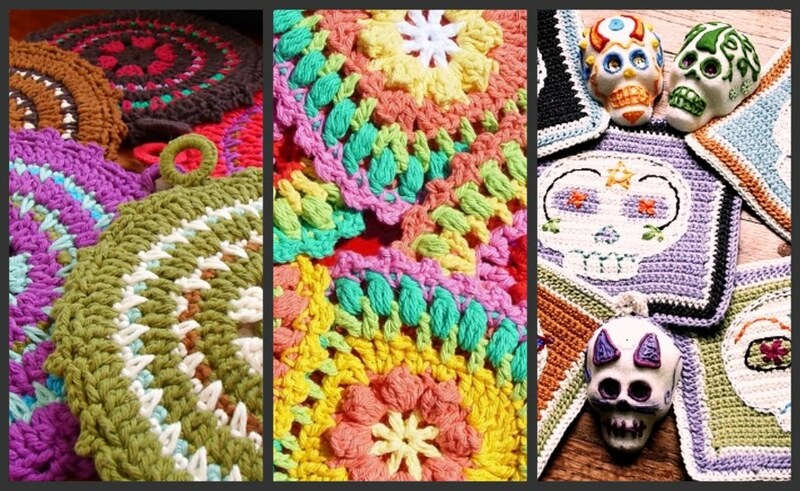 I've finished my entries for this year's Dishcloth Swap. I used a stitch pattern that I found years ago in a stitch dictionary. I varied the colors for each cloth. Cotton dishcloths are really wonderful. They last for years and are great for scrubbing pots and dishes. I also use 100% cotton cloths in the shower. I like to call them Spa Cloths. Fancy! Yes, it was a very hot weekend in Los Angeles. We tried to limit our activities considerably. There was quite a bit of knit and/or crochet and sitting in front of the air-conditioner and/or fan. On Saturday night we drove over to hotter Atwater Village for a lovely potluck birthday party for our friends, Claire and Tom. We always have fun at their get-togethers. Claire and Tom have an electic group of friends, full of wonderful conversation. The food was great...mostly salads....no one wanted to turn on their oven and actually cook! A wonderful time was had by all. It was too hot to even take photos on Saturday. I did manage to snap some of our hosts. I LOVE Tom's colorful ensemble! Claire is always well-groomed, not matter what the weather is.